1. How to breathe and the correct postures in which to meditate. 2. Aspect and notable qualities of each of the seven colors. 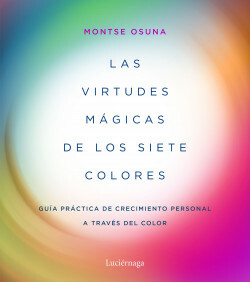 Each color has its own teaching, and the author uses different resources to explain it. For example, green, which is life, is illustrated by a detailed explanation of samsara, the Buddhist wheel of life. 3. Meditation and colors. Section designed to help the user visualize the qualities of colors and integrate them into his or her life. 4. Seven cards where all the information of each color is concentrated for easy study: the qualities of the color, its gemstone, the universal law to which it responds, its chakra, its day of the week, its aroma, etc.